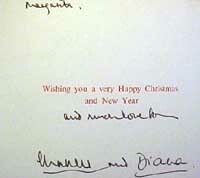 The Royal Familys Christmas cards contain signatures with a photograph. 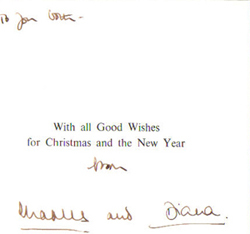 Christmas cards have a royal insignia on the outside & open to a two-sided card with the greeting, "with best wishes for Christmas and The New Year"on the left and a photograph on the right. These cards are the most sought after and collectible Christmas cards in the world, most of which rarely appear in the market place. Most remain in cherished private collections. 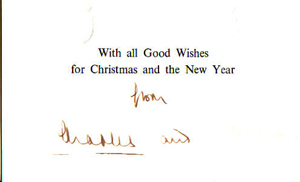 The Christmas Cards below are a rare and valuable part of history. I have purposely deleted all salutations and greetings to protect one's privacy. They are not in chronological order. There are approximately 50 cards in this collection. 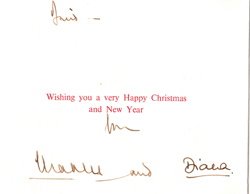 Do research before buying signed letters, Christmas cards and photographs. Many items being offered on the Internet by "dealers" and on "auction sites" are described as original signatures when , in fact, they are auto pen. A personal greeting does not make the signature authentic. 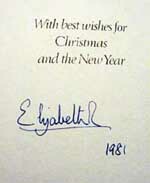 The royal family sends thousands of letters, cards and photographs each year. They are given typed letters, Christmas cards and photographs already auto penned. They add the personal greeting. A Certificate of Authenticity can be made and printed by anyone! Check the seller or companies credentials. Some cards are in chronological order, some are not. 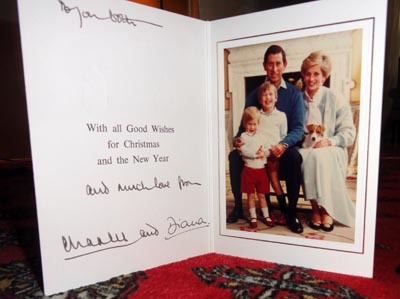 Item 2001 - A wonderful, rare 1982 signed Christmas card with a photograph of Charles and Diana with baby Prince William. 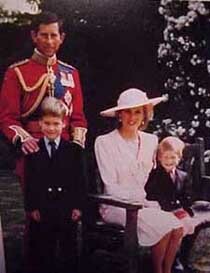 Prince William Arthur Philip Louis was born on 21 June 1982 at St Mary's Hospital, Paddington, in London. 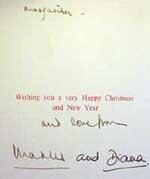 There is a hand written greeting to one of Diana's bridesmaids and her brother. 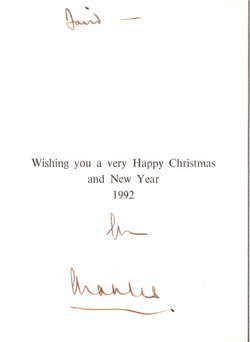 This is the second card sent by Charles and Diana. Their first card in 1981 showed them wearing their wedding attire. 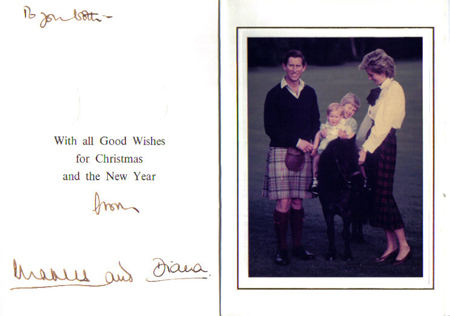 The outlook still seems rosy in 1982 (right), at just six months, Prince William makes his Christmas card debut. His birth indeed brought great joy and the months after his arrival were the happiest of the couples marriage. 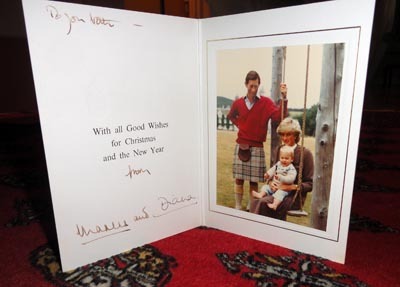 Item 2003 - Another of the 1983 Charles and Diana Christmas card with Diana holding baby Prince William. A wholesome country life look, but there is already a hint of separateness. Things are going wrong. Di-mania had started and Charles felt ignored. Diana was in the grip of the eating disorder bulimia. Item 2004 -Here is the second of the Charles and Diana cards with a wonderful photo of Charles, Diana, the new born Prince Harry and an adorable 2 year old Prince William. 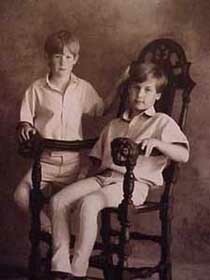 Prince Henry Charles Albert David was born at 4.20pm on September 15, 1984 at St Mary's Hospital, Paddington, in central London. He weighed 6lb 14oz. A new son, not the daughter Diana longed for, provided the heir and spare. Charless reaction Oh its a boy and hes even got rusty hair (a Spencer trait) was the beginning of the end. From that moment, the Princess later said, something inside me died. Item 2005 - One of my favorite cards. I love the way William is holing on to baby Prince Harry. Dianas failure to look into the camera, more marked than the previous year, was an early hidden code that all was not well. While the increasingly thin Diana devoted her efforts to William and Harry, the Prince, unable to deal with the mood swings of his wife, buried himself in official duties. 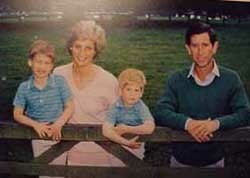 Item 2006 - Another wonderful card with a photo of Charles and Diana with their boys. They were so adorable and have grown up to be two nice young men. Diana would be proud. Seeing these photos, it's hard to believe there was such unhappiness behind Charles and Diana's smiles. The smiles were forced, the unity a fiction. Diana had blossomed into a sophisticated beauty, but Charles had re-started his relationship with Camilla. To the outside world, which avidly tuned in to their TV interview with Sir Alastair Burnet, though, all seemed well. The Prince and Princess were leading quite separate lives. 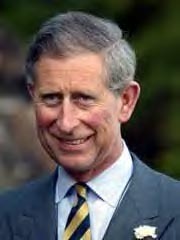 Charles, increasingly, stayed at Highgrove, while Diana was happier at Kensington Palace. Matters had come to a head when the Princess confronted Camilla at a birthday party. Seven years of pent-up anger, jealousy and frustration came flooding out. Item 2008 - This card is simply beautiful. Diana was at her loveliest. This care was written to Princess Margarita of Yugoslavia. The image is supposed to convey togetherness, but yet again they are not touching. Not just separate lives but it would almost seem separate fields would be preferable. Both were now having adulterous affairs but for the sake of their children  and the country  there was a semblance of marital unity. Rarely seen together, there was one significant appearance for the wedding of Dianas brother, Charles, to model Victoria Lockwood, also to end in tears. Item 2009 - These cards tell a story. This card from 1990 shows a smiling , happy Diana but we all know that wasn't the real story. Diana's no longer on the pedestal in this marriage. The once-shy Diana found solace  gaining attention and increasingly adoration  in public engagements. She had already broke new ground with her campaign against Aids, now she championed issues involving the elderly, the infirm and drugs. 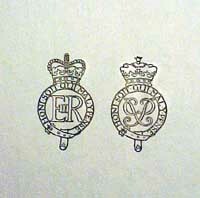 Item 2010 - It is wonderful to follow these cards from year to year. 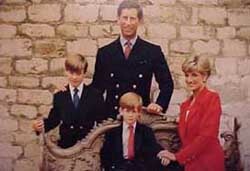 They show the progression of a family from 1981 when Charles and Diana married until the present with Charles and the boys. Unfortunately, it is a sad journey. This 1991 card is sad! 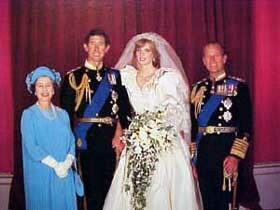 It is the last time Charles and Diana posed together. Their next card was of the boys alone. It's hard to tell from this card what the next year would bring. Stiff and awkward, the marriage was over in all but name. An accident involving Prince William, when he was struck by a golf club, showed how far they had grown apart. 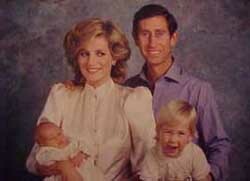 Diana slept by her sons hospital bed, while Charles fulfilled an opera engagement. 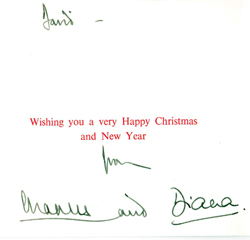 Item 2011 - This is the last card sent by either Charles & Diana with both their signatures or separately in 1992. After this card, they each sent separate , individual cards. It is a wonderful black and white photo of the boys. So sad this was no longer a together family. 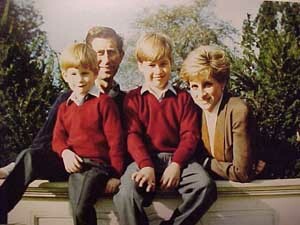 Nothing could speak for this years royal separation more than a card showing just William and Harry. It was the annus horribilis  the Squidgy tape, the Morton book and the Windsor Castle fire. Diana changed the locks at her palace apartments.